Your ratings and reviews help other decide on the products that are right for them. Your opinion on product details and benefits like quality, comfort and styling help everyone have a better shopping experience. Tell Carter’s what you think and you could win a $100 gift card in the Carter’s Write a Review Sweepstakes. Five winners every month! In order to enter this sweepstakes, you’ll need to write a product review. To get started, find a product you purchased at Carter’s and click “Write A Review”. You’ll be required to either sign in or create a new account. Then, rate the product (1-5 stars) and write your review in 200 words or less. You are allowed to write as many reviews as you wish during the sweepstakes period. The current Sweepstakes Period starts at 12:001 a.m. ET on Thursday, March 10, 2016 and will be ending at 11:59:59 p.m. ET on Saturday, April 9, 2016 so be sure all your entries are received by the end date to be eligible for the sweepstakes. 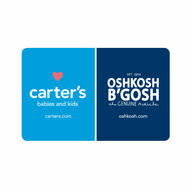 By writing a review, you could win 1 of five $100 Carter’s OshKosh B’Gosh Gift Cards. The Carter’s Write a Review Sweepstakes is open to legal residents of the United States and the District of Columbia who are 18 years of age or older at the time of entry and who have a valid email address and Internet access during the Sweepstakes Period. For complete details, including Official Rules, visit www.carters.com.